The Zodiac MX8 is ready to battle your pool's toughest dirt and debris. The dual cyclonic suction enables the MX8 to move faster and deliver unsurpassed vacuum power, while requiring 30% less flow. Its ultra efficient design requires less flow than any cleaner in its class for maximum energy savings. Best choice for solar, 2-speed, and variable-speed pumps. It has a wider cleaning path than competitor models, with a large vacuum inlet to capture larger debris. 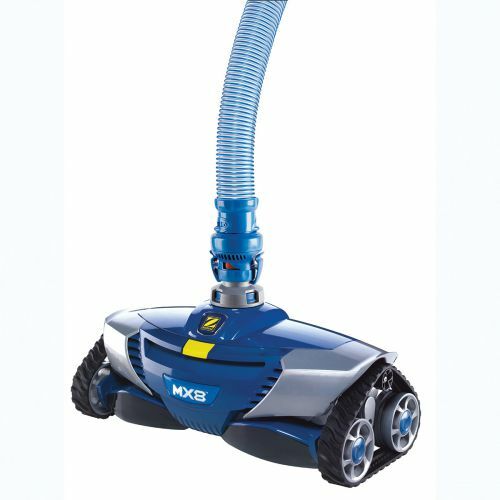 maX-drive technology promotes maximum torque and extreme maneuverability, allowing the MX8 to aggressively clean your pool walls and floors. Its twist locking hose enables quick, secure attachment to the cleaner head and the cleaner includes 39 feet of hose. maX-Drive Navigation Advanced dual navigation for best pool coverage with no hang ups. Thoroughly cleans floor, walls, and waterline of any size or shape pool. Dual Cyclonic Vacuum Provides maximum suction power and extreme wall climbing ability. Flex-Power Turbine Ultra efficient operation on low-flow without compromising power.